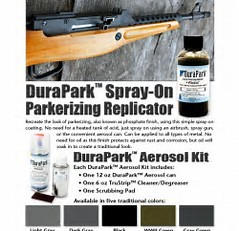 Recreate the look of parkerizing, also known as phosphate finish, using this simple spray on coating. No need for a heated tank of acid, just spray on using the convenient aerosol kit. Can be applied to all types of metal. No need for oil as this finish protects against rust and corrosion, but oil will soak in to create a traditional look.